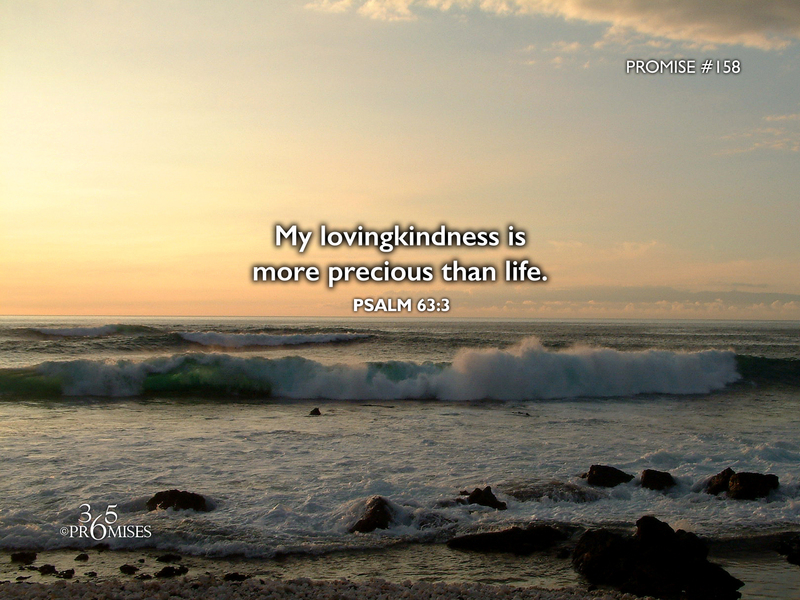 In this promise, the psalmist is making a declaration of God's amazing lovingkindness and how His love is better than life itself. The writer goes on to say that the only appropriate response to such a wonderful love is to live a life of loving God back in the form of presenting our bodies as living sacrifices. I really believe that every person on the planet was created to respond to love. In 1 John 4:19, it says that we love because He first loved us. God is the ultimate initiator and we are His ultimate responders. When we truly begin to receive His lovingkindness in every area of our lives, the only appropriate response is to love Him back with every fiber of our being and praise His wonderful name! Our God and Father's desire is that we live in His love all the days of our lives, and be a vessel in which His love can flow to us and then through us. The more that I experience Papa's amazing, unconditional love for me, the more that I join with this verse and declare that God's lovingkindness is better than life!